The Performance Targets for quarter to 30 September 2011 are circularised. That the information concerning the Nambucca Valley Youth Services Centre be received. Council may wish to make representations to the Department of Lands, its Local Member or the relevant Minister, the Hon. Katrina Hodgkinson in support of the Nambucca Valley Youth Services Centre. Council could seek legal advice in relation to the liability of the Nambucca Valley Youth Services Centre to pay rates. Council can provide financial assistance to the Nambucca Valley Youth Services Centre equivalent to its liability to pay rates. However this will create a precedent for “similar” organisations to receive the same financial assistance. Potential examples are the Bowraville Pioneer Community Centre and the Nambucca Valley Bridge Club. An inspection of the Nambucca Valley Youth Services Centre (NVYSC) has been arranged for the General Purpose Committee meeting at the request of the Centre. It is understood the request relates to tenure and financial issues faced by the Centre in their use of their premises at 48 Ridge Street, Nambucca Heads. According to the NVYSC they met with the Department of Lands in March 2011 to negotiate a lease agreement, having been without a lease since 2009 when NSW Scouts passed the old Scout Hall (now Youth Centre) back to the Crown. In September 2011 a licence was received from the Department of Lands. · An obligation for the NVYSC to use their best endeavours to furnish any/all information requested in order to enable due consideration be given to any tenure beyond the expiry date of the licence. They are concerned that due to the grant funding arrangements for their operations they will not be able to demonstrate a financial capacity for long term tenure and accordingly will be unable to meet the requirements of the license. · The payment of back rental from the time the previous lease expired, some $4,000. Instead the NVYSC believes the funds should be applied to fixing up the gutters all of which are argued to be dangerous and falling down. The Department of Local Government Council Rating and Revenue Raising Manual 2007 provides that a charity in its legal sense comprises 4 principal divisions: trusts for the advancement of religion; trusts for the advancement of education; and trusts for other purposes beneficial to the community, not falling under any of the preceding headings. As to what are “other purposes beneficial to the community”, the Manual advises there is a wide ranging assortment of purposes which have been held to be within the “spirit” or “intention” of the preamble to the Statute of Charitable Uses 1601 but otherwise seem to lack a common denominator, and hence cannot be more informatively labelled. The Manual indicates a “charity” is “public” within the meaning of Section 556 of the Act if its “benefits” are available to a substantial body of the public even though the number able to receive the benefits at any one time is limited. The fact that the objects of the body are restricted to a particular class of persons does not in itself deprive the body of its character as a “public” charity. In respect to rateable properties not deemed to be a public charity, such as a non-profit organisation or community club where residential or business categories are used. At the Council’s discretion a council may provide financial assistance to these groups to pay part or all of the rates and charges. In these circumstances a rates notice must be raised and served on the owner of the rateable land. Council’s Rates Officer has previously considered the rateable status of the NVYSC and deemed that the use was not a charity and was rateable. In 2011/2012 Council levied $1,883.07 in rates, $438 for a domestic waste service as well as water and sewerage access charges. There has been consultation with Mr Chris Hewgill, the Chairperson of the Nambucca Valley Youth Services Centre. The Youth Services Centre provides an important support service to the youth of the Nambucca Valley. It is expected that Mr Hewgill will provide a briefing on the youth programs conducted by the Centre at the General Purpose Committee inspection. The recommendation has no budgetary implications. The last significant change to Councils rate structure was undertaken in 2005/2006 following the general re-valuation base dated 1 July 2004. This was as a result of significant fluctuations in land values across the Shire. Prior to 2005/2006 Council’s structure was the same for all sub-categories – consisting of an ad valorem with minimum. The current Farmland structure was adopted in 2005/2006 to maintain compliance with the Local Government Act whereby the ad valorem rate had to be the lowest rate across all categories. This Section of the Act was repealed shortly after adopting and levying rates for 2005/2006. The current farmland structure comprises a base amount of $473.90 with an ad valorem rate of 0.0034239. Total yield from the Farmland Category is $773,519.54 with average rate per assessment being $1,625.04. Of the 476 assessments currently rated farmland, 452 would be better off being re-categorised to Residential. There are several options available to address this anomaly. 3 The Business sub-categories of Manufactured Home Community and Caravan Park be abolished and assessments previously sub-categorized Caravan Park and Manufactured Home Community be transferred to the Business category together with current yield. 1. Review criteria for Farmland category to better reflect more intensive farming pursuits. Ie. current beef farming criteria is minimum 40 head of cattle. This number could be increased so as to only apply to assessments where farming is the primary income and sole purpose of the property. 2. Consider options for abolishing the Farmland rate and re-categorising all properties residential-rural. 3. Consider applying the statutory minimum of $442.00 together with an ad valorem. 4. Ad Valorem rate only. For properties to be categorised as Farmland, eligibility criteria must be met. This criteria was last reviewed in 2007. Opportunity exists for Council to again review the minimum criteria with the intention of increasing the minimum criteria to better reflect more intensive farming pursuits. However, if Council were to increase farmland criteria, a review of all properties currently categorised farmland would be required to determine movement of assessments, land values and yield. This would be a highly intensive project of which Council does not currently have the resources to undertake 476 inspections in the short time frame given. Currently, 25% of assessments are reviewed annually to ensure compliance with current criteria. Opportunity exists in the future to review the current criteria and then apply the new criteria to future property reviews. This option has not been seen before. This is not the preferred option as it does not reflect the current dominant land use. The regulations provide for a statutory minimum currently $442.00. Council may choose to apply the statutory minimum of $442.00 to Farmland properties together with ad valorem. This option was not previously possible due to Section 520 of The Act requiring the Farmland rate be the lowest rate in the dollar. Since the last major review of Council’s rate structure this section of The Act has been repealed. The introduction of the statutory minimum will result in an increase in the ad valorem rate, however will lessen the variation of rates across differing valuations. In applying the Statutory Minimum and maintaining current yield, only 14 assessments would be levied the minimum amount of $442.00 whilst all other assessments exceed the minimum. The shaded area represents the majority of assessments within the Farmland Category. ** The highest land value within the farmland category. The minimum amount may be increased by the approved rate peg annually. The ad valorem amount of a rate is an amount in the dollar determined for a specified year by the council and applied to the rateable land value, except as provided by The Act. The making of a wholly ad valorem causes greater fluctuations between rates payable and places an increased burden on properties with high values whilst decreasing the contribution of rates from properties with lower land values despite receiving the similar if not the same services. Maintaining the current yield equates to an ad valorem rate of 0.00482769. The table below illustrates the excessive variations of a wholly ad valorem rate when applied to the land valuations. Consideration may be given to reducing the base amount of the Farmland category. A base amount can be used to flatten out the incidence of excessive variations within a category where land values can vary significantly. It should be noted that the base amount must reflect a quantifiable cost per property that represents the basic administrative costs of council and from which all properties benefit, regardless of their rateable land value. A base amount, equitably determined, can enable council to charge all properties subject to the rate a sufficient levy to cover the cost of common services, as well as basic administration costs. For the purpose of this report and modelling scenarios, a base amount of $320.00 has been assumed. Section 500 of The Act provides that the yield generated from the base amount must not exceed 50% of the yield generated from the ad valorem component. · Re-categorise sub-categories Caravan Park and Manufactured Home Community to Business category together with yield. Correspondence received from the Department of Local Government on 3 March 2009 suggests council may not comply with the Local Government Act in regards to sub-categorisation of the Business categories Manufactured Park Home and Caravan Park. Approximately 50 NSW councils received similar correspondence. During discussion with Damien Walsh, Senior Finance Officer, Division of Local Government in relation to the sub-categories, Mr Walsh advised the correspondence did not intend to claim Council was in breach of The Act, but merely serve as a reminder for Council to review its rating structure and ensure Council’s ability to defend its structure should a challenge arise. Refer attachment 3. It should also be noted that Mr Walsh was unable to provide examples of any previous rulings in regard to the application of sub-categorisation of the Business category. Council at the time reviewed the sub-categories and resolved to maintain the current structure. Council again has the option to review the sub-categories Caravan Park and Manufactured Home Community and consider transferring the assessments and yield concerned into the Business category. This structure would enhance Council’s justification in regard to Section 529(2)(d) and ‘centre of activity’ requirement. The Manufactured Home and Caravan Park sub-categories were introduced by Council in 2003/2004 with the aim of generating an equitable rate contribution based on the number of permanent home sites within the property. In relation to the Manufactured Home sub-category, Councils planning records list Newville Cottage park as currently having 42 permanent sites, whilst Faringdon has 190 sites. The ad valorem rate for Business is 0.00572658 whilst Manufactured Home Community Sub-category is 0.00572768, and Caravan Park 0.00985854. In transferring the yield from the Manufactured Home and Caravan Park assessments to the Business category, the total yield of Business category is $340,400.31 over 188 assessments resulting in an ad valorem rate of 0.00704454. This results in a significant decrease in rates for the Caravan Parks and an increase in rates for the previously sub-categorised Manufactured Home assessments as well as an increased burden on the pre-existing business assessments. Clearly these figures will vary dependant upon individual land valuations. The difference in yield generated from the assessments previously categorised Manufactured Park and Caravan Park of $31,026.51 will be apportioned over the assessments already within the Business category. Given that the majority of land values within the Business category are less than $200,000 and the majority of high-end land values are attributed to the Caravan Parks and Manufactured Home assessments, the impact on individual accounts will predominantly be felt by those assessments with values greater than $200,000. The percentage yield derived from the minimum amount currently exceeds the percentage yield generated from the ad valorem yield. Whilst this does not contravene the Act it is not the intention of the Act to generate majority of income from the minimum. There are 3 sub-categories of the Residential category: Town, Village/Estate and Rural. Council has historically maintained the same ad valorem rate and structure across the 3 sub-categories. The current structure of the residential categories comprises a minimum of $690.35 with ad valorem 0.00409875. Total Yield is $6,383,004.64, of which $3,876,315.25 (or 61%) is generated from the minimum. Minimum rates aid in flattening out excessive variations in rates where land values vary significantly. · Maintain the status quo. Reducing the minimum to the Statutory minimum, currently $442.00, whilst maintaining the current yield for each sub-category will not only increase the ad valorem rate, but also result in significant variations in the ad valorem rate between the sub-categories (refer below). Ultimately a broader variance in the rates payable across the sub-categories will result. The variation in ad valorem may better reflect the current service levels provided to properties in the differing sub-categories. Ie. Residential-Town with higher ad valorem rate, whilst Residential-Rural has the lowest. A base amount needs to represent a “quantifiable cost per property” that represents the basic administrative costs of council and from which all properties benefit, regardless of their rateable land value. Whilst The Act provides for “base amounts” the overriding characteristic of local government rating is that rates will be primarily and predominantly determined via the ad valorem method. Hence, income derived from the base amount must not produce more than 50% of the total amount payable by the levying of the rate. A base amount can be used to “flatten” out the incidence of rates across ratepayers where land values vary greatly within categories of ratepayers or where there is disproportionate variations arising from a new valuation. Attachment 2 Comparison of differing base amounts for Residential Rates highlights the variance in rates when varying base amounts are applied. It should be noted that a base amount of $400 or greater will result in non-compliance with The Act, whilst the lesser base amounts will create a broader variation in rates payable over differing land values. Therefore this structure is not the preferred option. Maintain consistency and equity amongst community – both individuals and businesses. Re-distribution of rate yield will result in varying impacts across ratepayers within Business category. Possible legal challenge if Council is found to contravene Section 529 of The Local Government Act 1993. Current yield is maintained, therefore there is no effect on current or future budgets. Council is required to prepare a State of the Environment Report each year, this year being a supplementary report to the 2008/2009 Comprehensive SoE. The Draft SOE report was on exhibition for 28 days closing on the 10 November 2011. At the time of writing this report 8 November 2011 there were no submissions received. Should any submission be received after the closing of the Agenda a late item will be prepared and submitted at the General Purpose Committee meeting on 16 November 2011. The Draft SoE report not be endorsed. The Department of Local Government issued on 8 August, a Circular (11-18) that advised Group 2 and 3 Councils Annual Reporting Requirements are set out in the historical version of the Local Government Act 1993 (the Act) (section 428) and the Local Government (General) Regulation 2005 (the Regulation) (Part 9, Division 7), and Group 2 and 3 councils are required to prepare a supplementary State of the Environment report for 2010-11 and submit this to the Division by 30 November 2011 (see section 428(2)(c) of the Act and clause 217(2) of the Regulation (historical version)).Therefore this year’s report will be a supplementary report. The draft report was missing some state agency data which has been added since the exhibition period. This is due to the staggering of group 1, 2 & 3 Councils to the new IPR requirements and many state agencies had not been prepared for group 2&3 requests for information. Notwithstanding, the supplementary report for the 2010/2011 year has included some community/ stakeholder input and has been placed on public exhibition in accordance with Council’s resolution in November 2007. This 2010/2011 supplementary report is an update of the eight environmental sectors: land, water, air, biodiversity, waste and resource recovery, noise, Aboriginal and non-Aboriginal heritage and this year includes a new section called 'living sustainably'. This is the old human settlement section without the community data as this is reported on in a separate community report and thus, will reduce duplication. This supplementary report is to be read in conjunction with the comprehensive State of The Environment Report from 2008-2009. Next years SoE will be a comprehensive report in line with the new IPR requirements. For the past two years representatives from Councils falling within the Northern Rivers Catchment Management Authority's area, Tweed Shire Council down to Port Macquarie – Hastings Council, have been working with the Department of Premier and Cabinet to facilitate a regional SoE. Next years SoE will be a regional Comprehensive State of the Environment Report, and will be produced once every four years. From 2013 there is no requirement for Councils to produce supplementary (between comprehensive years) reports. This is a report on the state of the Nambucca Shire’s environment. The report is designed for the community to read and understand what the state of the environment is like in their Shire with clear remediation actions. There is no economic assessment. There are no perceived direct impacts on budgets. · the proposed residential area has insufficient area to accommodate buffers to rural land and still provide feasible residential development. a Council could support the Planning Proposal and it be forwarded to Department of Planning for a Gateway Determination in accordance with section 56 of the Environmental Planning and Assessment Act 1979.
b Prior to proceeding with the planning proposal the applicant be requested to address the outstanding issues identified in this report. c Prior to proceeding with the planning proposal the applicant be requested to pay the scheduled fee for a rezoning application. · Allowing 24 additional residential lots to adjoin a rural area may contribute to land use conflicts and the proposal does not address required buffer distances within Councils DCP 2010. · The land presently provides flood refuge for stock, and the proposal is silent on an alternative stock flood refuge or potential cumulative impacts should a new stock flood refuge be proposed. · The proposal must be consistent with the Rural Planning Principles listed in State Environmental Planning Policy (Rural Lands) 2008. The applicant has not addressed these principles within the planning proposal and the planning proposal is not consistent with a strategy. · The proposal is not identified as an agreed growth area within the mid north coast regional strategy. · The proposed dwelling floor levels should be re-evaluated in the event that future studies are adopted by Council. It is noted that the RTA in conjunction with the Office of Environment and Heritage are preparing a new flood study for Macksville and its surrounds. This flood study will take into account predicted impacts associated with climate change and the new highway. The results of this study will be available to Council, which after review will be used to update Council’s flood risk management plan. Any decision relating LEP amendments in existing flood prone land within Macksville Floodplain are considered premature until the current studies are complete. The rezoning of this land from rural to residential appears to be unwarranted at this stage. Further consideration of this matter could be undertaken when Council prepares it’s Local Growth Management Strategy - Residential Land. If Council supports an LEP amendment at an inappropriate location or prior to the up to date information being available it may have implications on Councils exemptions to liability under Section 733 of the Local Government Act should the subject land subsequent development be impacted by flooding. A new type of asphalt reclaimer (Asphalt Zipper) has recently been introduced into Australia. This machine has potential to improve Council’s treatment of large pavement failures and broad scale road rehabilitation. A two week trial hire has been arranged to determine the machine capabilities and cost comparisons. An inspection as part of the GPC has been arranged. That Council note the trial of the Asphalt Zipper. The Asphalt Zipper has been in use of the US for many years. A new machine has recently been imported into Australia and a two week trial has been arranged. A copy of the brochure is attached. The machine is a portable reclaimer that attaches to a front end loader bucket. The Zipper rips and mixes existing road pavements (including both spray seals and asphalt surfacing). Depending on the quality of the mixed material it can either reused or discarded. The two week trial will be used to treat large pavement failures in both urban and rural roads plus various options for the full rehabilitation of rural roads with a view to replacing the current method of cement stabilisation. Funding included in current budget for Heavy Patching operations. “1 That Council note the receipt of the Flood Investigation – Phase 2 Seaview Street Catchment Report and presentation. This report provides recommendations for Council to consider with regard to flood mitigation measures initially for the effected properties within the Seaview Street catchment and for future standards of urban drainage performance within the Shire. · In addition, where a development is designed in such a way that the major system flows involve surcharge across private property, then the underground system (both pipes and inlets) shall be designed to permit flows into and contain flows having an ARI of 100 years from the upstream catchment which would otherwise flow across the property. 4 That in accordance with the Australian Rainfall and Runoff (AR&R) and AUS-SPEC#1 Design Specifications September 2002 future developments shall define a surcharge path for systems even where a 100 year Annual Recurrence Interval flow can be maintained within the system. 5 That in accordance with the Australian Rainfall and Runoff (AR&R) and AUS-SPEC#1 Design Specifications September 2002 future developments are to provide easements within private property over pipe systems and surcharge paths. 1 That Council accept the recommendations. 2 That Council not accept the recommendations. · 5 years for other residential areas and open spaces. In addition, where a development is designed in such a way that the major system flows involve surcharge across private property then the underground system (both pipes and inlets) shall be designed to permit flows into and contain flows having an ARI of 100 years from the upstream catchment which would otherwise flow across the property. A surcharge path shall be defined for systems even where 100 year ARI flows can be maintained within the system. Easements are to be provided in private property over pipe systems and surcharge paths. 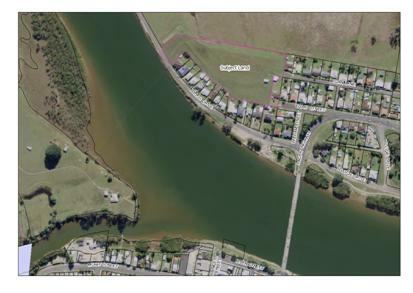 Following a storm event in June 2008 Council engaged GHD to initially prepare a report on the catchment area in the vicinity of Nambucca, Bismark and Piggott Streets, Nambucca Heads. Subsequent to this initial report Council commissioned GHD to prepare a more detailed report to identify deficiencies in the existing system and options (including preliminary costings) for design standards and upgrading of the drainage system. A representative of GHD presented the findings of the Phase 2 report with a breakdown of flood mitigation costing for Council’s consideration at the General Purpose Committee meeting on 17 August 2011. The Phase 2 report suggests the existing pipe system has an appropriate capacity equivalent to the 2 year ARI storm event and that the trunk drainage system is exceeded in the 5 year Average Recurrence Interval (ARI) storm event. The existing drainage system was constructed to the standards and knowledge of the day where the contributing catchment consisted of low density housing with a clear flow path in place for larger storm events. Subsequent subdivisions of residential land have created a higher density of housing resulting in the net loss of pervious open space, this in turn accelerates the rate of discharge to the drainage infrastructure of the catchment to a point where the pipe system can no longer cope with a 5 year ARI storm event. The GHD report estimates the cost of stormwater pipe augmentation to be $1.88 million which would then cater for the 100 year ARI Storm event. The report deals with an isolated catchment that was brought to fruition due to the flooding of houses in June 2008 and funding is competing with a large number of other projects requiring similar funding such as the land slippages along Riverside Drive. 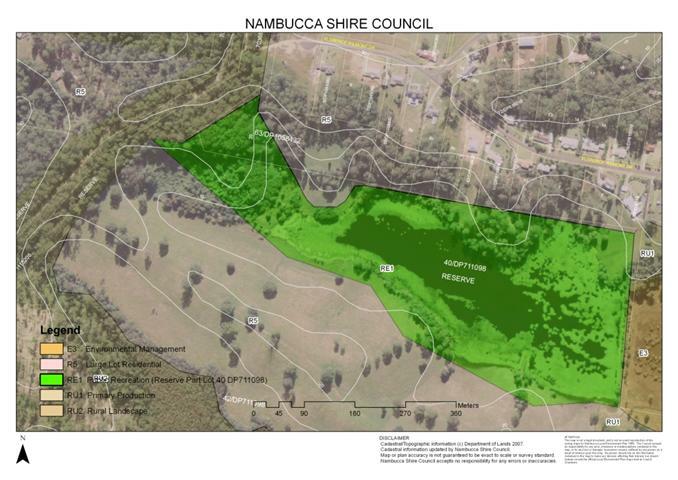 Nambucca Shire Council’s LGA contains numerous individual stormwater catchments that would have been constructed and installed to the standards of the day. This report is limited to an isolated catchment area being Seaview Street and a change or adoption of a new standard would have implications Shire wide. · Providing upstream detention storage. The objective of each of these scenarios was the reduce the overland flows along the main trunk line, and increase the flows into the trunk line, thus reducing the impact of stormwater to affected low lying properties. · the upgrading of the trunk main in each of these scenarios effectively reduces the overland flows and inundation levels. The GHD report identified seven of the eleven properties investigated in the report are prone to flood inundation for the full range of 5 year ARI to 100 year ARI storm events. These properties are all adjacent to the natural gully of the catchment and the piped drainage systems. These sites are by no means in a prime location and were no doubt priced accordingly knowing the risks of building adjacent to a gully. A further scenario was developed in which the existing pipe system was to remain unaltered and upstream detention storage would be sized to cater for the 100-year event. The detention storage option required an approximate total storage volume of 3,400 m3 (or equivalent to 340 box culvert sections with dimension 2.4 x 1.7 x 2.44) to detain the 100-year ARI storm event using a 375 mm diameter outlet pipe, under the Zingara Close / Nambucca Street intersection. When considering cost benefit results there is a known cost of installing flood mitigations measures (additional stormwater pipes or detention) commencing in the vicinity of $630,000 to $1.18 million versus the unknown cost of flood damage to a small number of properties. The Preliminary concept design is attached for information. The proposed increase in stormwater pipe diameters is considerable in comparison to the existing pipe diameters. To cater for an increase in drainage structure it will be necessary to widen the easements and to adjust pipe locations to cater for any proposed improvements on private lands. The existing drainage system within the Seaview Street stormwater drainage catchment was constructed to the standards and knowledge of the day. (Existing urban developments have been designed to accept stormwater discharge for a range of events). However, with continued development many pipes are insufficiently sized and discharge paths are either nonexistent or have obstacles such as fences, buildings and landscaping in place. Council may elect to adopt the “do nothing approach” in lieu of funding an upgrade to the drainage infrastructure (estimated to cost between $630,000 and $1.18 million depending on ARI adopted). However, it may result in ongoing claims against council for flood damage to property for the drainage system between Zingara Close and Bismark Street. The Average Annual Damage is estimated at $150,000. Over a 20-year period, this has a Net Present Value of $1.8 million. There are no impacts as a result of this report. There are no immediate issues as a result of this report, however, future storm events can cause flooding of private property resulting in stress and financial loss for residents. There are no immediate economic issues as a result of this report. However, if Council wishes to adopt a higher design of standard of flood mitigation there will be a significant impact on future budgets. Conversely the “does nothing” option could result in increased damages claims. Future storm events could result in flooding of private property. Increased pipe capacities can mitigate this risk. This report is limited to one catchment. A change of standard would have implications Shire wide. There is no impact on the current budget unless Council is determined to upgrade the drainage system. Incorporation of a design storm in the Stormwater Asset Management Plan will impact on future budgets. Funds could be sourced from a stormwater levy or working funds. Waste and Sustainability Improvement Payments (WaSIP) are provided by the Office of Environment and Heritage (OEH) to assist councils improve waste and sustainability outcomes across their local government areas. Council’s initial strategy for allocation of WaSIP funds focussed on installation of energy efficient lighting. It is opportune to review this strategy and consider options for suitable projects for allocation of future payments. The purpose of this report is to gauge an indication of Council’s preferred direction for allocation of these payments. That Council endorse the proposed projects as options for the allocation of future Waste and Sustainability Improvement Payments. Council may suggest alternate projects for consideration. Waste and Sustainability Improvement Payments (WaSIP) are provided by the Office of Environment and Heritage (OEH) to assist councils invest in additional actions and programs that improve waste and sustainability outcomes across their local government areas. These payments are allocated by councils based on local priorities and WaSIP guidelines. Payments are made on the basis of Council meeting standards set by the OEH. These standards relate to matters such as provision of recycling services, collection and return of baseline data on waste management, development of a Strategic Waste Action Plan and a “Waste Not” Development Control Plan. Nambucca Shire Council complies with these standards through membership of the Midwaste Regional Waste Forum. Midwaste consists of eight individual councils from Great Lakes in the south to Coffs Harbour in the north. Representatives from each council meet monthly to form a voluntary regional waste group. Midwaste is funded by the OEH along with member councils contributing to the group’s efforts in reducing the amount of waste going to landfill through regional co-operation and partnerships. The focus of Midwaste is to provide best practice waste management, resource recovery and diversion of waste materials from landfill across the region by utilising the principles of sustainability as a driver in attaining the NSW Office of Environment and Heritage’s Waste Avoidance and Resource Recovery (“WARR”) Strategy. Council has received payments of $34,700 in 2009/10 and $69,500 in 2010/11. These payments have been utilised to install energy efficient lighting at the Council administration building, Nambucca Heads and Macksville Libraries and the Nambucca Heads Entertainment Centre. Anticipated savings as a result of these installations are $2,500 per annum at the administration building and $1,150 per annum at the libraries and entertainment centre. Council has received payment of $108,000k for 2011/12. It is expected that funding will progressively increase to approximately $200,000 by the end of the current program in 2014/15. The initial strategy for allocation of WaSIP funds focussed on installation of energy efficient lighting. Opportunities for further installations of these lights are becoming limited so it is opportune to consider options for suitable projects for allocation of future payments. It is not intended that these payments be used in lieu of Council’s working funds but rather that they are utilised to fund additional programs or infrastructure which provide improved sustainability outcomes. Individual projects would be identified each year as detail of actual funding becomes available and any specific eligibility guidelines are issued. The purpose of this report is to gauge an indication of Council’s preferred direction for allocation of these funds. Implementation of the proposed projects is expected to return favourable impacts on Council’s environmental sustainability. Specific impacts will vary from project to project but may include reduced dependence on reticulated electricity, reduced emissions from motor vehicles and improved waste avoidance. By investing in sustainable projects Council will be setting a positive example for the community and be better able to promote sustainability principles throughout the shire. Implementation of infrastructure and programs with improved efficiencies and more sustainable long term benefits will result in an overall benefit to the economic performance of Council’s operations. No direct impact is anticipated as any funds provided by WaSIP are additional to Council’s existing work program. There may be flow on benefits where through installation of more efficient infrastructure through this program future maintenance expenditure may be reduced. Funds sourced from Department of Environment and Heritage, no requirement to use working funds. This report provides Council with the draft Plan of Management for Part Lot 40 DP 711098 Old Coast Road, Kingsworth Estate. In accordance with Council’s direction, the draft Plan of Management was provided to Councilors for their comment in advance of the November Council meeting and the document has been amended to reflect the comments received. Adopt the draft Plan of Management for Part Lot 40 DP 711098 Old Coast Road, Kingsworth Estate and place the document on public exhibition. The landowner of the adjacent property, Lot 63 DP 1058432, approached Council with a proposal for a boundary adjustment to enable a land swap between the Council reserve land and the rural land within Lot 63. Council resolved to proceed with the Draft LEP (Amendment No. 62) on the 20 April 2006 and Council received an authorisation to issue a Section 65 Certificate on 7 July 2006, and exhibited the draft plan from 25 August 2006 to 22 September 2006. 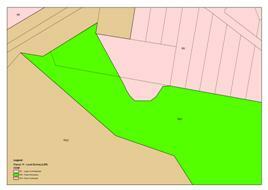 The Draft LEP was for the rezoning of the land to be exchanged and reclassification of the open space land. Council were provided with a report from the Strategic Planner at the Ordinary Meeting held 7 July 2011 on the results of the public hearing of the Planning Proposal for Nambucca Local Environmental Plan (NLEP) 2010 Amendment Number 1. There are environmental implications associated the management of the reserve. There are no financial impacts on councils budget associated with this report for the 2011/12 budget. · The 1st and 3rd par appear to be in conflict ie ‘[the landowner of the adjacent property] approached Council with a proposal...’ and ‘Council sought the land exchange and reclassification’. Amend the 4th paragraph to read ‘Council concurred with the land exchange and reclassification’. 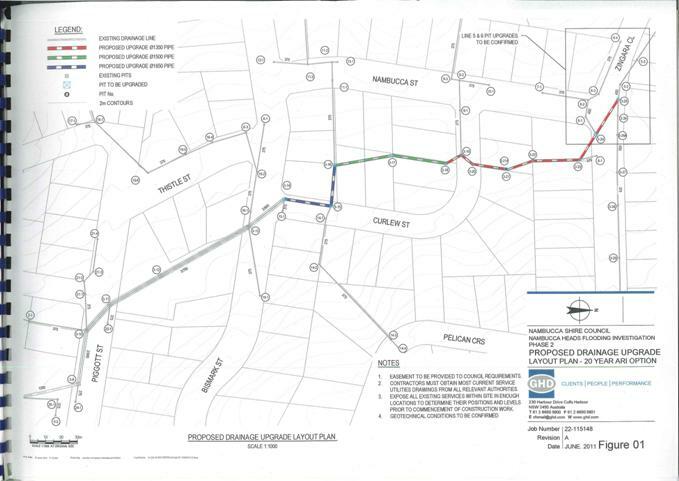 · 3rd par refers to the lack of legal access to Old Coast road fro Florence Wilmont Drive but it is unclear how this issue relates to the land exchange. Does the exchange create a legal vehicle access from Florence Wilmont Drive? · This par also refers to the dam but the map on p2 does not show the dam and other features are either unmarked or unclear ie clear lot numbers, Old Coast Road etc. A clearer map would improve readability. · 1st par refers to the plan applying to the community land in the category of Natural Bushland and that this land is part Lot 40, but the map does not clearly depict Part Lot 40. · Last par refers to old LEP zones. · 3rd par – I think emergency fire fighting was also part of the emergency use planned for. Amend - or emergency access for water in times of drought and for water to be used for fire fighting purposes or as a dust suppressant at other times. · Should specify what land NSC owns. 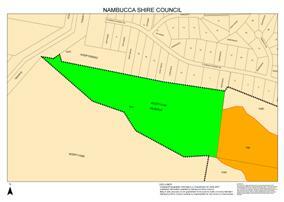 Amend - Nambucca Shire Council is the owner of the land. Part Lot 40 DP 711098 Old Coast Road, Kingsworth Estate. Re public safety – will there be public access to the dam? This is a high risk aspect which will need careful consideration. Trees with termites provide an important food source for many native fauna species such as echidnas and are a normal part of a bushland ecosystem. They should not be removed, unless they are in immediate proximity to private property vulnerable to termite damage and it can be shown that the termites pose a problem. This action is not appropriate for the ‘Maintain the natural flora’ objective section and would be better placed under a separate objective target eg ‘minimise impacts to neighbouring properties’. Needs new target of ‘Fauna Protection’ with means being (preferably) No Dogs in the reserve but at the very least only dogs on leashes.